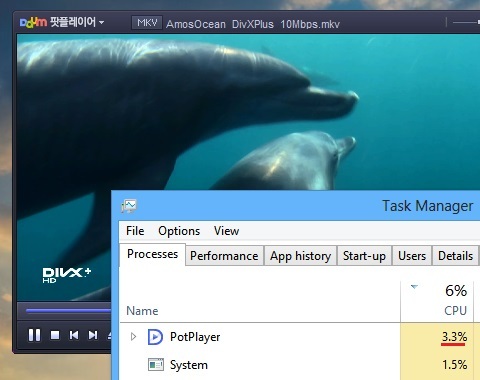 For years, ‘KMPlayer’ has been my favorite media player under MS Windows. It can play almost any audio/video codec, has a beautiful UI, comes with a huge number of options, completely free, one couldn’t ask for more :D.
I’ve also used ‘Media Player Classic’ (comes with ‘KLite-Codec pack’), though I have a tremendous respect for it, I just can’t stand its ugly user interface. Anyhow, from recently, I’ve been having some playback & video rendering issues with ‘KMPlayer’ under Windows 8. This wasn’t surprising either, because according to my experience, ‘KMPlayer’ is not the most durable/robust one out there. So, not that I ever thought that I’d find a replacement for it ;-), but out of my frustration, yesterday I Googled ‘replacement for KMPlayer’ and came up with another one called ‘PotPlayer’. It had a look at some of its screenshots and to my surprise, it looked almost like ‘KMPlayer’, later only to realize that it actually is being developed by the ‘KMPlayer’ developers. So I installed it and gave it a go, and within the first few minutes, I got extremely impressed by it!. In simple terms, this is the highly improved version of ‘KMPlayer’. I don’t know why they didn’t just improved ‘KMPLayer’ rather than creating another one, nevertheless, it’s really good. Both ‘KMPlayer’ and ‘PotPlayer’ share so much in common, but ‘PotPlayer’ comes with few additional ones that are pretty awesome. ‘DXVA’ (developed by Microsoft) lets a chosen number of codecs to be decoded by using your GPU (Intel HD 2000 and newer, AMD 6xxxx series and newer, Nvidia Gefore 500 series and newer) and thus offloading your CPU. Since the GPU is more efficient at handling multimedia tasks, if you have a laptop or something similar, then it’ll output less heat and reduce power consumption. I have an Intel HD 3000 GPU, and I easily saw the drop of CPU usage under some of those codecs. 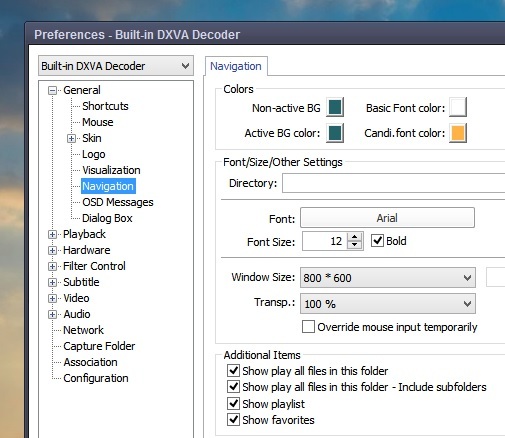 ‘PotPlayer’ by default uses ‘EVR’ (‘Enhanced Video Renderer’), and this is required by the ‘DXVA’ as well. Not only the video looks more sharp (including ‘OSD’ messages and subtitles, even under videos with low resolutions), I had no problem whatsoever while switching between fullscreen & windowed mode, unlike with ‘KMPlayer’. This is a recent trend (a useful one) that’s seen in some media players and ‘Video On Demand’ services (such as in ‘YouTube’), in which you see a thumbnail preview when you move your mouse over the ‘progress-bar’ area. This is disabled by default. Yet, once enabled, ‘PotPlayer’ was able to show thumbnail previews without any delays or without affecting the current playback. Very nice. 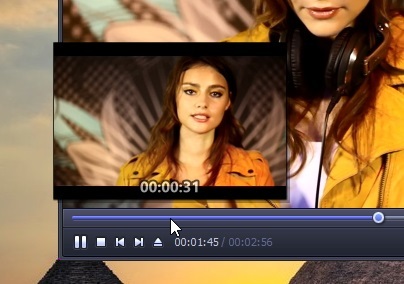 One of my favorite features of ‘KMPlayer’ is the awesome collection of audio & video filters that come in handy while enhancing the quality of the output. Not only ‘PotPlayer’ comes with all those filters, better yet, it also supports multi-core powered video processing. 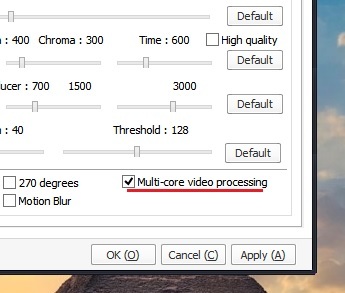 So, while applying video filters such as ‘Denoise’, ‘Sharp’, ‘Motion Blur’ … if you have a CPU with multiple cores, then they’ll all be used (depending on the requirements of course) for gaining the optimal quality. ‘KMPlayer’ only supports the 32-bit CPU. Now you can use the 32-bit version of ‘KMPlayer’ on a 64-bit version of Windows, but a ‘pure’ 64-bit version improves the performance (specially if the codecs and others are also 64-bit). Luckily, ‘PotPlayer’ comes with both versions!. This is where the true power of ‘KMPlayer’ lies (if you know what you’re doing :P). And as mentioned above, ‘PotPlayer’ also has a very similar look-n-feel to ‘KMPlayer’ but there are visible changes too. For example, I like the new ‘Preferences’ window. Some entries have been removed, new ones added, and at the end, we have a more cleaner looking ‘Command center’ :D. ‘KMPlayer’ has a lot of tabs filled with settings, but in ‘PotPlayer’ they’re better arranged and virtually tab-less. There is also a new ‘Network’ settings section that allows you to configure few network (streaming) related options as well. However, unlike ‘KMPlayer’, ‘PotPlayer’ only lets you change the audio sync by using built-in presets (each consisting of 0.005 seconds) rather than letting us manually enter the sync. This I find to be a bad implementation and is actually the only bad thing that I’ve found so far too. So hopefully it’ll be ‘fixed’. One of the subtle yet important aspects that makes a great multimedia player is its responsiveness. For instance, while playing something, if you hit the ‘Pause’/’Resume’ buttons or move the ‘seek-slider’ around to play into a different position, a great media player, given the fact that you have the proper hardware, should respond almost instantly. This is also the case with ‘PotPlayer’. Even after enabling the ‘thumbnailed progress-bar’, I experienced no lag in responsiveness. 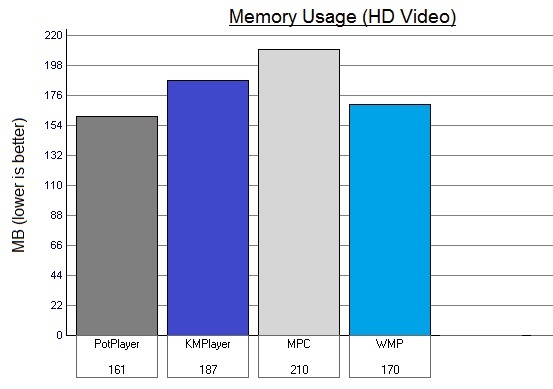 I ran few simple tests and monitored the CPU usage and the memory consumption and compared the results with ‘Windows Media Player’ in Windows 8, ‘KMPlayer’ 3.5.0.77′ & ‘MPC’ 1.5.3.4003 (somewhat older). Except for ‘PotPlayer’ and ‘WMP’, all others were 32-bit apps running on 64-bit version of Windows 8. 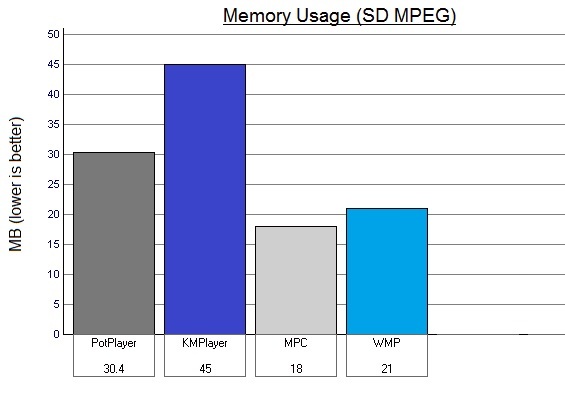 I ran a few tests, but built the below graphs after playing a SD MPEG 1 (old) video (without ‘DXVA’), a SD FLV (with ‘DXVA’) and a full HD video (with ‘DXVA’). The CPU usage varied a bit, while playing the old MPEG1 video, WMP registered the lowest average CPU usage with others closely following. While playing both SD FLV and HD video, ‘PotPlayer’ registered the lowest average CPU readings. But under all these tests, they were pretty close. Except, ‘KMPlayer’ suffered a massive CPU usage consumption as it played them without ‘DXVA’. Anyhow, since they’re pretty close, I won’t list the CPU usages, but here’s a list of the memory usage. SD video file details: Resolution (352 x 288), 1146 Kbps, 25 fps, MPEG 1 audio (224 Kpbs), Stereo, MPEG container format. SD FLV video details: Resolution (640 x 360), 527 Kbps, 23.98 fps, AAC audio (97.3 Kbps) Stereo, FLV container. HD video details: 1080p HD (H.264, 30 fps, 9 Mbps, MP3 Stereo) with 60 fps, MKV container format. 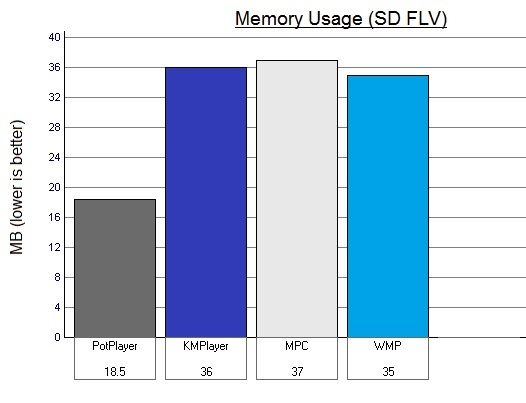 It’s also worth noting that, PotPlayer’s memory usage fluctuates more (both up/down) when comparing with other players. 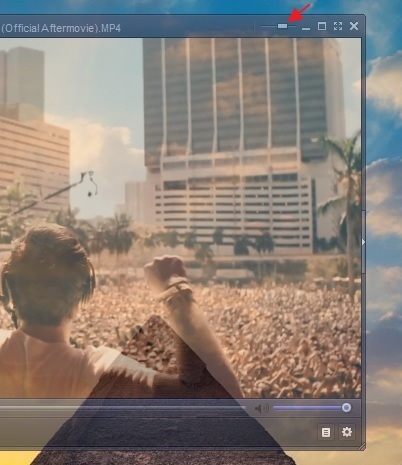 I’m not a huge fan of adding transparency effect to a video player, but there’s a new control (slider) built onto the top toolbar that lets you adjust the transparency easily. This also a very handy feature if you go to bed with your music ;-). ‘KMPlayer’ also supported a similar function, but it doesn’t let us manually enter a time, ‘PotPlayer’ does!. ‘PotpPlayer’ also comes with new icons for different file types, though some, I find to be too ‘girly’ for my ‘manly’ taste ;-). These are of course just small number of new features that caught my eyes. So, if you’re a ‘KMPlayer’ user or a Windows user who’s looking for a more efficient, easy to use, lightweight (most of the time), free media player that can be used to play almost all audio/video codecs, then although it is still a ‘Beta’ software, I highly recommend ‘PotPlayer’ (dear ‘KMPlayer’ developers, thank you!). If interested, please get it form here. Next link is the official ‘PotPlayer’ home page (the ‘setup’ hosted here uses Korean as the default language). I think the overall user interfaces of KMPlayer are still much better than anything else including potplayer. Thank you ‘Paul’. I can’t find that audio sync option though, can you point me towards it ? Audio sync can be manually set by going to Preferences > Audio > Language/Sync/Other. Thanks ‘Kate’!, appreciate, although it seems to only apply to the selected language. Plus, I like to have an option to change this setting just like KMPlayer lets us. Yea, it’s pretty good. And you’re welcome also :). Hi. I am trying to disable transparency feature but cannot find it. Its very difficult to watch a movie when icons are visible through the screen. There is a slider around the right-corner of the title-bar of ‘PotPlayer’, you can move it to the right-side for reducing (or completely disabling the transparency). In what way does it differ from VLC? Well, they’re quite similar actually. It’s just a matter of preference I guess.